The environment secretary is due to meet the Food Standards Agency, food suppliers and retailers on Saturday to discuss the horsemeat scandal after Aldi became the latest supermarket to confirm its withdrawn beef products contained up to 100% horsemeat. Only shop at Waitrose for me, no horsemeat scandals there. Thanks for posting. Aldi just opened new store here in small town MN. Haven't been there...don't think I want to go. Surprised that Aldi has been around for quite awhile. It's a German-based company opened back in 1976 by two brothers, later split up by the bros when they split. Batavia (hope spelled right) IL was the first US store opened. From what I've been reading, thanks to comments on some of the articles, it mostly carries its own brand of products without many places of origin on the labels. 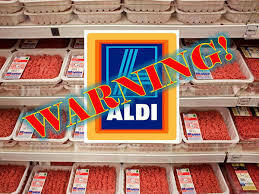 While some labels clearly say Made in US, others say distributed by Aldi...Be very careful about what you buy there, especilly checking out the produce, dairy and meat. Thanks Carrie. Thank you Carrie. I don't purchase any meat . But appreciate the heads up. I RIDE HORSES = I DO NOT EAT THEM ! ! ! ! ! The same problem was in Europe, now the meats are tested quite a lot for horse meat.This is so disgusting. Aldi in the UK are causing grief for all the main supermarket giants given their prices. I never shop at Aldi. Article is from 2013. Never knew this was going on, but hope all is resolved now. Yuk. Why can't we know what is in the products we buy? "This issue has periodically been the subject of renewed Internet chatter in the U.S. even though the topic is an old one and (contrary to some versions) did not involve any Aldi outlets in the United States."